At the end of January 2014, there were at least 74 political prisoners in Papuan jails. The visiting delegation of Melanesian Spearhead Group (MSG) leaders was a highly politically charged event, and demonstrations were predictable. However, both the seniority of the civil society leaders heading the demonstrations and the repressive police response, in defiance of the media spotlight, highlighted just how high the stakes were on all sides. As is often the case in Papua, protests were intended to highlight the long history of human rights violations in Papua, and in doing so the ongoing nature of those violations was demonstrated as protestors were arbitrarily arrested yet again. While protestors targeting the MSG delegation in Jayapura were manhandled, arrested and dispersed, protests targeting the delegation in Jakarta were not subject to these repressive tactics, despite getting far closer to members of the delegation than their colleagues in Papua. As numerous commentators noted, the state response to the protests was something of an ‘own goal’ for Indonesia, given that the original reason for the visit was to investigate the human rights situation in Papua. The extremely heavy sentences proposed by the Prosecutor for defendants in the 1 May 2013 Biak case crystallised the trial into a critical test case for Indonesia’s policies in Papua. Five of the six defendants are threatened with 15-18 year sentences for peacefully raising the Morning Star flag in Biak. Their case echoes that of Filep Karma, who was imprisoned ten years ago and continues to serve a 15-year sentence for the same peaceful act. As the trial continues, Papua’s courts face a clear choice: to allow history to repeat itself in defiance of national and international law, or to steer a new course. Reports of the torture of 12 men detained at demonstrations in November 2013 once again raise concerns about the treatment of political detainees in Papua, particularly in the Jayapura regional police station. The detainees were tortured, isolated and denied access to lawyers, with reports of torture only surfacing once the detainees were transferred to Abepura prison and could be accessed by lawyers and human rights workers. This is a recurring pattern. An area of particular concern is the fact that police were untruthful to human rights lawyers offering to represent the detainees, stating they already had representation, although this was not the case. These tactics are frequently reported and appear to be a deliberate strategy to ensure that illegal and inhumane police practices can continue undisturbed throughout the investigation process. The slow emergence of information about political arrests in Sarmi and violence, political arrests and population displacement in Puncak Jaya highlighted the extreme difficulties in accessing accurate real-time information from most parts of Papua. On 13 January, seven protestors were arrested at demonstrations aimed at the visiting MSG delegation. According to a report by the Papuan branch of the National Human Rights Commission (Komnas HAM), demonstrators from across the civil society spectrum had prepared to greet the MSG delegation at Sentani airport at 06:00 on the morning of the visit but were foiled by authorities who received the delegation an hour earlier. Disappointed, demonstrators then headed to the office of the Papua Regional House of Representatives (Dewan Perwakilan Rakyat Papua, DPRP) to launch their protest. At around 10:00 Papua time, under instructions from the Vice-Chief of the Papua National Police, Kiki Kurnia, Markus Haluk, Secretary General of the Alliance of Papuan Central Highlands Students (Aliansi Mahasiswa Pegungungan Tengah Papua, AMPTPI) was arrested while addressing the crowd. Police also arrested Mama Abina Wasanggai, Basoka Logo, Toni Siep, Wolak Wob, Jimi Broay and former political prisoner Yusak Pakage. The demonstration was forcibly dispersed and police confiscated banners, megaphones and a camera. Dozens of other protestors were herded to the police station, from where they refused to return home until the seven detainees were released. Majalah Selengkah reported that demonstrators were manhandled, including elderly human rights defender Mama Yosefa Alomang who was dragged around and left with torn clothes. The detainees were held at the Jayapura police district command (Polresta) for around five hours before being released without charge. While police denied that arrests had taken place in online reports published by Tempo, the Komnas HAM report clearly documents the arrests, also corroborated by a witness statement from one of the detainees received by Papuans Behind Bars. While in police custody, detainees state that they were treated reasonably. New information received from human rights lawyers in Papua states that two men have been in Sarmi police detention since their arrest in December 2013. Civil servant Edison Werimon and Bank Papua employee Soleman Fonataba were arrested on 13 December and 17 December respectively. Early inquiries suggest that Werimon was arrested for having a Morning Star flag decoration or mural in the living room of his house, whereas Fonataba is thought to have been arrested for possession of five Morning Star flags in his house. The men are accused of conspiracy to commit treason under Articles 106, 110, 53 and 55 of the Indonesian Criminal Code. On 4 January, Deber Enumby was arrested in Kurilik village near Mulia, following the theft of eight firearms from the Kurilik police post by suspected members of the National Liberation Army/Free Papua Movement (Tentara Pembebasan Nasional, TPN / Organisasi Papua Merdeka, OPM). He has been charged with Emergency Law 12/1951 and potentially faces the death penalty, according to Papua police. According to reports from civil society groups and human rights activists, Enumby is not a member of the TPN/OPM. Several weeks later, two men were arrested following violence between security forces and armed members of the TPN/OPM in Puncak Jaya throughout January. On 26 January, Yenite Morib and Tiragud Enumby were reportedly arrested during a raid at Dondobaga church, Kurilik, in Puncak Jaya. According to a report by an independent local human rights activist, while security forces suspect the men of being members of the TPN/OPM, they are ordinary civilians. While the names of the men were originally reported as Dolak Telenggen/ Tenius Telenggen and Melkias Telenggen/Tigabur Enumbi, the same report states that the originally reported names were pseudonymns. Morib and Enumby, aged 18 and 19 respectively are reportedly unemployed, were severely tortured on arrest and were denied food in police detention for at least two days. Reports from church sources and local media state that the arrests were made amidst violent sweepings at Dondobaga church. While this was initially reported as a military operation, the West Papua National Committee (Komite Nasional Papua Barat, KNPB) state that the raid was carried out by members of police Mobile Brigades (Brigades Mobil, BRIMOB) and Special Detachment 88 (Detasemen 88, ‘Densus 88’). The KNPB further state that Pastor Pamit Wonda and congregation member Lurugwi Morib were bayoneted by security forces and are currently receiving treatment in Mulia general hospital. Churches and local media state that hundreds of people from the congregations of Kunilik and Dondobaga churches have fled their villages following the raid. Online Papuan news site Majalah Selengkah reports that houses have been burned down by security forces in the area, local residents are unable to go to church, people are unable to farm and there are fears that famine could ensue. According to Jubi, the Chief of Puncak Jaya police denies that there was any attack on the church congregation. There were no reported releases in January 2014. The five men being tried for a peaceful flag-raising ceremony in Timika in May 2013 were given eight month prison sentences on 25 November 2013. The men were convicted of conspiracy to commit treason for their role in the ceremony, were reportedly tortured on arrest and have suffered various health problems while in prison, for which they did not receive medical attention. On 13 January 2014 the public Prosecutor issued his indictment for five of the defendants in the Biak 1 May case. He demanded an 18-year prison sentence for Oktovianus Warnares, who led the peaceful flag-raising action in Biak on 1 May 2013. A 15-year prison sentence was requested for George Simyapen, Jantje Wamaer and Yoseph Arwakon, as well as Markus Sawias, who is being tried separately with Yohanes Boseren. The trial of Yohanes Boseren remains suspended due to mental health issues brought on by heavy beatings at the time of his arrest; see TAPOL’s Urgent Appeal for details. Despite lawyers’ calls for his immediate release, Boseren is still being held in Biak prison. The sentences requested for the five men are far longer than those requested for comparable cases in recent years, and according to local human rights lawyers, no evidence has been presented in court to support a credible conviction. On 23 January, lawyers for the defendants filed their defence and requested that all charges against the five men be dropped and the men be released. On 30 January, the prosecutor rejected the defence plea and called for the men to be sentenced in accordance with the original sentences demanded. The trial is set to continue in February. On 19 October, the Biak activist Piethein Manggaprouw was arrested for his involvement in a peaceful demonstration commemorating the second anniversary of the Third Papuan Congress, a peaceful event in 2011 which ended in mass arrests and fatal shootings by security forces. On 17 January, after 109 days in detention, Manggaprouw’s lawyers reported that his case had now been handed to the Prosecutor. According to his lawyers, the trial is scheduled to begin on 3 February. In November 2013, Papuans Behind Bars reported that Manggaprouw was being denied food and receiving only one meal a day, severely affecting his physical health. A local activist who has been monitoring Manggaprouw’s conditions now reports that he is receiving two meals a day. On 6 January, activists from the Papuan Student and Community Movement (Gerakan Mahasiswa Pemuda dan Masyarakat Papua, GEMPAR) met with Chief of Papua Police, Tito Karnavian, to demand the immediate release of Yason Ngelia. Student leader Ngelia was arrested on 7 November 2013 during protests at Cenderawasih University (Universitas Cenderawasih, UNCEN) campus. The students have already demonstrated several times to protest Ngelia’s arrest and subsequent ill-treatment, but despite this and the meeting with Karnavian, the legal process continues and Ngelia’s trial began on 22 January. 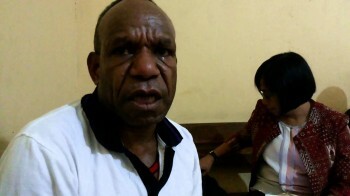 According to Papuan online news site Jubi, while being initially accompanied by lawyer Olga Hamadi, Ngelia has stated that he does not want legal accompaniment and will represent himself from now on. GEMPAR activist Alfares Kapisa noted that while Ngelia was arrested for leading a demonstration criticising the controversial drafting of the ‘Otsus Plus’ law, the trial seems to focus on a dispute between Yason and his friend Stanley almost six months earlier. Kapisa, who himself was detained for more than two weeks in November 2013 following demonstrations, suggested that the trial was a strategy to keep Ngelia from leading critical demonstrations against Otsus Plus. On 24 January, the 12 men arrested following demonstrations on 26 November 2013 in Jayapura were transferred from police detention to Abepura prison. Upon their arrival in the prison, interviews conducted by a local human rights activist reveal that the men are not activists and were not even involved in the demonstrations, which were being held to support the opening of a Free West Papua Campaign Office in Papua New Guinea, as well as the Sorong to Samarai campaign. According to the interviews, the 12 men were engaged in various activities when they were arrested. One was on the way to see a friend after college, another two were on their way to a relative’s birthday party. Four of the men are Aloeswood traders from the Star Mountains (pegunungan bintang) region who were visiting Jayapura and had been advised to stay in the house of their relative that day. Two agricultural labourers were on their way to the airport to see off a friend travelling to Wamena. One young man was preparing for a sculpture exam the following day, making a bamboo flute in his yard. On going to buy some cold water he encountered police. A builder changing buses at Waena ran from the gunshots and hid in the bushes, where he was apprehended by police. A gold panner was on his way to work at Sentani Puai when he was stopped and dragged into a police truck. The men were arrested in various places, brought to Expo Waena and beaten, before being taken to Jayapura regional police station. That night they were beaten with bayonets, bamboo canes and iron rods, and kicked by police officers wearing jackboots. They were all tortured with electric shocks administered using electric cabels. Muli Hisage was hit in the testicles, and beaten with the police station printer. Pendius Tabuni was burned with cigarette butts. Mathius Mabel was threatened with a gun to the head. All 12 men were interrogated without a lawyer and forced to sign the police investigation report (berita acara pemeriksaan, BAP) without having read or understood it. Police seized six mobile phones, money totalling IDR 12,750,000 (USD 1,055), shopping and clothes from the men. Natan Kogoya missed his sculpture exam. While human rights lawyers in Jayapura had been informed by police that the 12 men were receiving legal aid from the state Legal Aid Post (Pos Bantuan Hukum, Posbakum) – reported in our December update – the men state that they have had no legal accompaniment since their arrest. They are charged with manslaughter and maltreatment under Article 170)1, 2)3, and Article 351)1 of the Indonesian Criminal Code. On 10 March 2013 Yogor Telenggen was arrested in Waena, Jayapura, and accused of shootings in 2012 against the Indonesian military. He was later charged instead for an attack on Pirime Disrict police station, allegedly under instructions of a local official in Puncak Jaya. Telenggen was reportedly charged under Articles 340, 338, 170, 251 of the Indonesian Criminal Code and Emergency Law 12/1951 for violent crime and possession of ammunition. Telenggen was reportedly beaten severely on arrest, denied legal representations throughout the extremely long interrogation process, and spent an unusually long time in police detention in Jayapura before being moved to Wamena prison. Papuans Behind Bars are concerned that Telenggen continues to lack legal accompaniment and is being denied access to a fair trial. Information received from human rights lawyers indicate that even though the Serui High Court has reinforced prison sentences handed to Edison Kendi and Yan Piet Maniamboi in July 2013 of 2 years and 18 months respectively, measures have not yet been taken to redetain them. Their lawyers have as yet no plans to submit a further appeal. On 10 January, Majalah Selengkah reported a statement by political prisoner Filep Karma requesting that the MSG delegates should meet with Papuan political prisoners from various jails across Papua. According to the same news site, on 13 January student group GEMPAR blocked the UNCEN campus in Abepura to criticise the MSG delegation visit and called on the delegation to meet with Papuan political prisoners and victims of human rights violations. A joint statement of Papuans in Java and Bali made on the same day, circulated by Papuan journalist Oktovianus Pogau, echoed the same demand, among others. Several commentators have noted the ‘own goal’ scored by Indonesia in its repressive reaction to the protests, which proved the very point that the MSG delegation was supposed to be investigating – ongoing human rights violations in Papua. In an article posted by Jubi on 14 January, Human Rights Watch’s Indonesia researcher, Andreas Harsono, condemned the arrests, underlining the guarantees in both national and international law which should allow the right to peaceful protest, and noting that the incident was a very bad advert for Indonesia. The same article also cited Papuan church leader Socrates Sofyan Yoman, who said that Indonesia had shown its ‘stupidity’ in making these arrests which clearly proved that Indonesia is not a democratic country. Senior Papuan lawyer Yan Christian Warinussey issued a statement on 13 January condemning the arrests, and stressed the lack of protection for basic human rights such as freedom of expression and freedom of assembly in Papua. The arrests were also condemned by Ruben Magai, Chair of the Papua Provincial Parliamentary Commission on Law, Human rights and Foreign Affairs (Komisi A). Charges against bailed Papuan demonstrators Alfares Kapisa, Benny Hisage, Abraham Demetouw, Danny Kosamah and Arnoldus Kocu must be re-examined following an amendment to Article 335 under which they have been charged. On 16 January 2014, Article 335 of the Indonesian Criminal Code was amended by the Constitutional Court, removing the wording ‘offensive treatment’ (perbuatan tidak menyenangkan) due to the elastic nature of the phrase. The move was welcomed by Papuan lawyer Yan Christian Warinussey who said in a statement dated 19 January that in its previous formulation Article 335 was “vulnerable to misuse and arbitrary application.” In 2012, the Jayapura Court prosecutor threatened to charge Papuan human rights lawyer Gustaf Kawer with offensive treatment under Article 335 for comments made during the high profile Third Papuan People’s Congress treason trial. On 23 January, the EU Sub-Committee on Human Rights held a hearing about Papua, where members of the EU parliament were addressed by representatives of the Indonesian government, as well as the Jayapura branch of the Alliance for Independent Journalists, Jakarta-based solidarity group NAPAS, and the International Coalition for Papua (ICP). According to the Jakarta Post, the ICP called on the Indonesian government to release Papuan political prisoners and open up Papua to international human rights mechanisms. Meanwhile in Papua, students from GEMPAR held a demonstration at UNCEN in support of the hearing, blocking entry into the campus. The students highlighted human rights violations and the silencing of democracy in Papua , calling for access to Papua to be opened for international journalists and the UN Special Rapporteur on Freedom of Expression. * Apolos Sewa, Yohanis Goram Gaman, Amandus Mirino and Samuel Klasjok are currently facing charges of conspiracy to commit treason. Even though they were bailed a day after their arrest, they are currently undergoing investigation and are vulnerable to re-arrest. They are currently obliged to report to the police twice a week. **Even though Edison Kendi and Yan Piet Maniamboi have now been released from detention, they are still facing a prison sentence of 2 years’ and 18 months’ imprisonment respectively. The verdict is currently being appealed. As reported in our September update, Kendi was again detained and questioned in relation to peaceful demonstrations before being released. Papuans Behind Bars is a collective effort initiated by Papuan civil society groups working together as the Civil Society Coalition to Uphold Law and Human Rights in Papua. It is a grassroots initiative and represents a broad collaboration between lawyers, human rights groups, adat groups, activists, journalists and individuals in West Papua, as well as Jakarta-based NGOs and international solidarity groups. Questions, comments and corrections are welcomed, and you can write to us at info@papuansbehindbars.org.